I made some revisions to my PDF of Expert Sleepers Ableton Setup Notes. 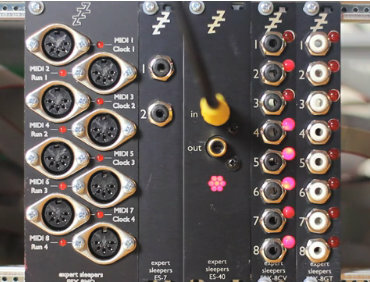 Expert Sleepers (brainchild of UK inventor Andrew Ostler aka "OS") makes Eurorack modules that allow a computer to talk to other Eurorack modules, converting MIDI and audio events in a Digital Audio Workstation into control voltages that can drive modules in a rack. At least, theoretically. The problem is making sense of a cloud of tutorials, demos, and user forum threads in an environment where the relevant products, DAWs, and operating systems undergo constant revision. Worse, OS assumes you can fill in gaps in your knowledge easily, and you can't. For example, in a video showing how you can control several hardware synths and sequencers using pitch and gate cvs coming out of the ES-40, ESX-8CV, and ESX-8GT modules, OS shows a tantalizing glimpse of his setup in Ableton. You can see a series of "aux" channels that he doesn't explain or show the routing for. These are necessary to drive gates separately from cvs. The curious consumer must delve into forum threads to find answers, separating the wheat of Ableton/Windows solutions from the chaff of Logic/Apple solutions. Eventually I got it, and now need to add a new "Section C" to my notes. These notes are a quixotic endeavour specific to Windows 7, Ableton 9[x], and a handful of modules at a certain stage of development, which means the instructions also need to be revised constantly -- the sand castle constantly threatens to collapse. Resounding silence followed my posting of the notes on the ES forum; the reason could be simple boredom, or that forum users have already moved on to next in a constant stream of shiny new objects emerging from OS's workshop. Alex on Film has been running a series of quizzes that test your powers of recall, observation, and movie knowledge. See if you can name the films behind these screenshots, grouped into themes. My identification rate is extremely low but that didn't stop my pitching in on severed heads, tattoos, people looking in rear view car mirrors, views through crosshairs, and hangings. Mostly I don't answer unless I know. I've skipped several quizzes either for lack of a contribution or because I thought I could safely miss it, e.g., eyeball mutilation (I have my limits).